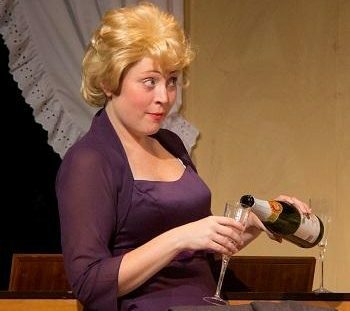 TR Robertson ….The first play of Oceanside Theatre’s 8th Season and first under new artistic director Ted Leib still retains the humor, sensitivity and timelessness even though it covers a relationship spanning 1951 to 1975. 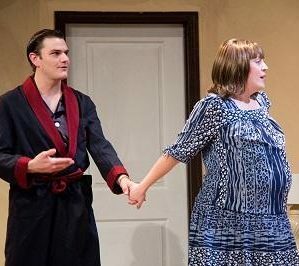 When it first appeared on stage at Brooks Atkinson Theatre in New York City, starring award winning actress Ellen Burstyn and Charles Grodin, critics referred to the play as a “funny comedy about love and adultery”. The play would run on Broadway for four years. The fascinating story line takes you through 6 time periods in the 25 year span of a relationship between two married people, married to other people, who first met at a bar in Northern California, had a weekend affair and decided to meet every year on the same weekend, same place and have managed to keep this promise for the past 24 years. Amazingly, not only are they married, but they live across the country from one another and they each have three children when they first meet. The final scene is the couple meeting for the 25th time. Director Ted Leib, brings together two talented actors, Eric Hellmers and Michelle Marie Trester, in telling this heartwarming story. We see George and Doris from their first nervous, tense encounter in 1951, through the changes life can bring and all of the turmoil, trauma and humor of their personal relationships with their spouses and their families. Scene two involves their 5th year of their secret meeting; Scene 3 deals with George’s impotency problem and a gasp from the audience when Doris enters pregnant; Scene 4 takes us to the turbulent 60’s as George and Doris have grown in different directions and a traumatic situation in George’s life; Scene 5 is 20 years into the unusual relationship and personal growth in George’s life that almost drives Doris nuts and the final Scene 6 in 1975, ends with more personal trauma and issues of commitment for the couple. With costumes designed by Dawn Fuller-Korinek, wigs by Jimmy Masterson, Bridgette Young and Eden Young and sound and sets by Ted Leib the audience can follow the time periods easily. Music from the eras end and begin each scene and the changing clothes and hair styles brings back memories for those that grew-up during these various times. As you hear the stories of George and Doris, you begin to understand what would lead them to both start and want to continue such an unusual relationship. These are two people with issues, like all of us; people wanting more in their life; like all of us; people that love their partners but feel there is more to life than what they are experiencing. All of this is handled with clever dialogue, humor, tenderness and you both identify with and feel empathy for these individuals. Eric Hellmers is performing in his 3rd show for Oceanside Theatre. He has performed in many regional productions as well as teaching and directing children’s theatre groups. Hellmers presents a wonderful interpretation of the neurotic George and shows great emotional range when George goes through a multitude of personal experiences in his life. Michelle Marie Trester has also performed in a number of regional theatre productions, most recently “The Effect of Gamma Rays on Man-in-the-Moon Marigolds” at Cygnet. She presents Doris and the wide range of personal changes she goes through with ease on stage. Doris goes from a timid, nervous woman, almost a bit ditsy, to a woman who has experienced many changes in her life She has remained loyally married to a man who she views as more of a provider and she has managed to grow not only emotionally, but intellectually, and a woman who has shown she is more than capable of being the provider. She also manages to not only stand up to George’s idiosyncrasies, but she is the rock of the unusual relationship. 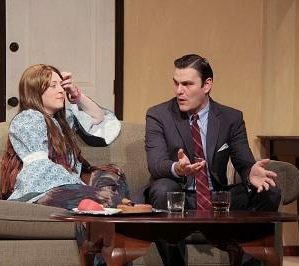 “Same Time, Next Year” was written by Bernard Slade and was nominated for Best Play, Best Direction at the 1975 Tony’s and won a Best Actress Award for Ellen Burstyn. It also won the 1975 Drama Desk Award for Outstanding New American Play and another Best Actress Award for Best Actress. The play was turned into a film in 1978 with Burstyn in the lead and also starring Alan Alda. The movie was nominated for four Academy Awards and Burstyn won a Golden Globe for Best Actress. 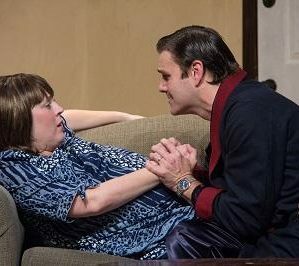 Certainly this play has an unusual premise for an ongoing relationship. It is hard to imagine a couple able to maintain such an affair for the length of time they did. George will find out he is not as clever as he thinks. Those in the audience enjoy sitting back and watching the lives of these people unfold before us and listening to their family situations, family problems and desires and dreams as we laugh with them and at them and feel the sting of sorrow for events that occur to them. 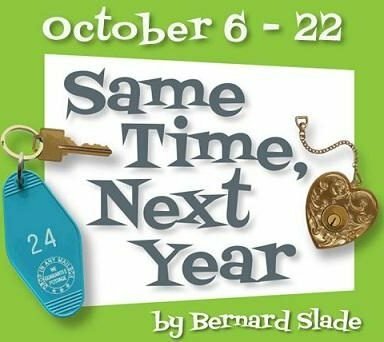 “Same Time, Next Year” will run until October 22 at the Oceanside Theatre Company in the Brooks Theatre on 217 North Coast Highway in Oceanside. Tickets are available at www.oceansidetheatre.org or call 760-433-8900. Up next for Oceanside Theatre Company is “Miracle on 34th Street” beginning on December 15th.